In just over a month, the world's first theme park devoted entirely to Italian food will open its doors—and Gastropod has the scoop! Among Eataly World's delights will be hunt-your-own truffles, baby lambs, beach volleyball, and custom Bianchi shopping bike-carts. But there’s a bigger story, and it’s that Oscar Farinetti, the founder of the Eataly empire, has somehow managed to make money by merging two businesses—grocery stores and restaurants—that are both incredibly challenging when it comes to turning a profit. In the process, he’s transforming the way we shop for food. Join us this episode as we tell the story behind the life and death of the great American supermarket—and take a trip to Italy for a sneak peek at its future. The supermarket is such a mainstay of daily life throughout most of the developed world that it's hard to imagine that someone invented it. But that is exactly what Michael Cullen did when he opened King Kullen in Queens, New York, on August 4, 1930. Before that, as Michael Ruhlman, the author of Grocery: The Buying and Selling of Food in America, explained, a grocery store was simply a dry-goods store, selling boxed and canned goods. To get their hands on perishable goods like meat, produce, and dairy, Americans had to either grow their own, await delivery (remember the milkman? ), or visit one of the specialist shops that started appearing in cities in the late 1800s and early 1900s—butchers, greengrocers, and creameries. The supermarket of today is many, many times bigger than the first King Kullen: it stocks 200 times as many products, and is often surrounded by a vast car park. But as impressive as it seems, the supermarket is in trouble. As Ruhlman explained, the typical grocery store chain operates on a tiny one-percent margin. "It's a crazy business model," he told us. "Nobody in their right mind would get into it." On every front, the supermarket is under attack: it is losing the price wars against Walmart, and the battle for convenience against Amazon, Instacart, and meal delivery services. And yet Oscar Farinetti, the founder of the Eataly chain of grocery megastores, has somehow managed to make selling food profitable again. How? 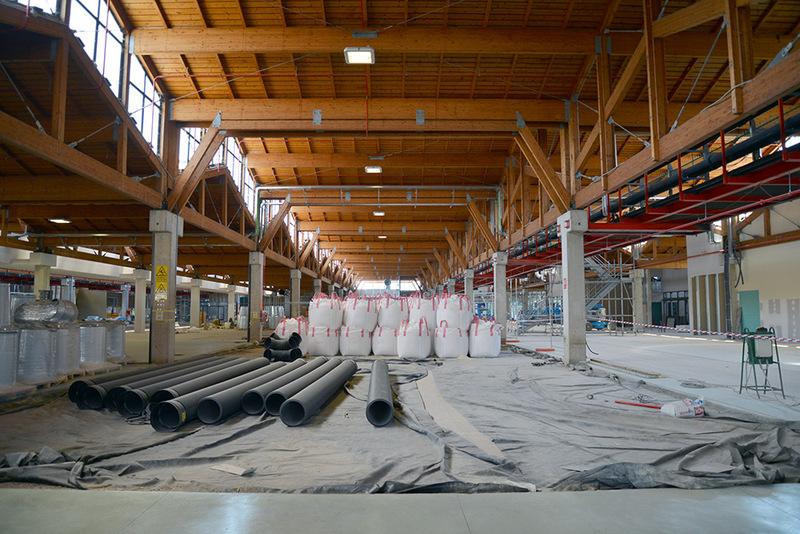 Bags of sand for the beach volleyball court, Eataly World. Photo by Nicola Twilley. To find out, this episode we speak with Sunil Gupta, Harvard Business School professor and author of a recent case study on the Eataly chain, as well as CEO Oscar Farinetti himself. The secret? It lies in a blend of good, old-fashioned synergy—combining the best of the restaurant and retail business models to overcome the weaknesses of both—and Farinetti's own creativity and passion for experiential story-telling. "I’d call him a maverick or a visionary," said Gupta, who sees the lesson of Eataly as "how you can take an old, traditional industry and completely re-imagine that." Listen in as we tease apart Eataly-nomics, experience its ultimate expression at Eataly World, and discover what Farinetti's example can tell us about the future of shopping for food. 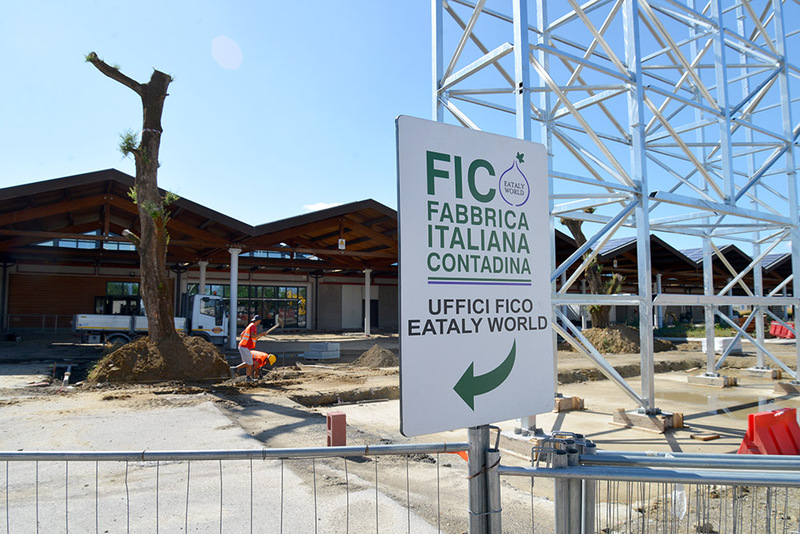 The Eataly World site under construction, including an 800-year-old olive tree transplanted from Sicily (where centuries-old olive trees were about to be cut down to make room for a road). Upon stepping inside, visitors will be greeted by a St. Louis-style arch, filled with Italy's hundreds of apple varieties. Photo by Nicola Twilley. 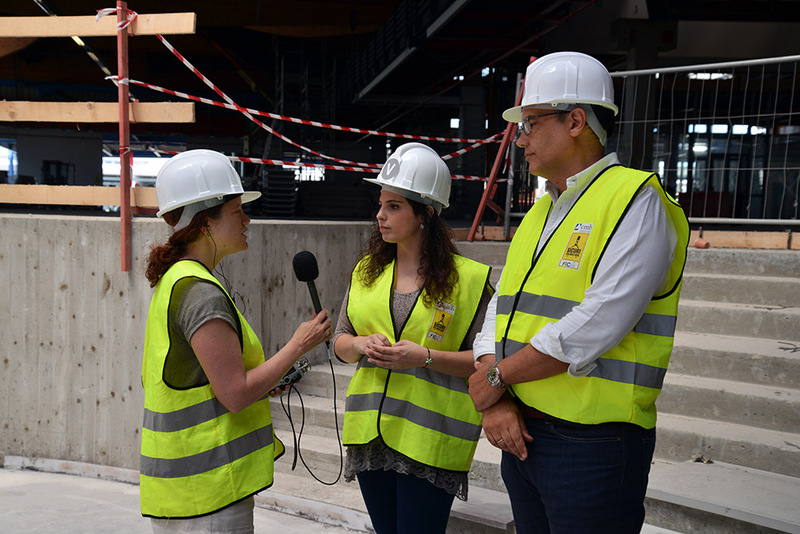 Cynthia with Silvia Zanelli and Thomas Bartoli in an events amphitheater, Eataly World. Photo by Nicola Twilley. We have exciting news! We are not doing a traditional pledge drive this year. (That said, Gastropod is precisely two people—Cynthia and Nicky—and advertising only covers about 50 percent of the show’s annual budget right now, so we do rely on your donations.) But what we really, really want is to grow. We know from our recent survey that 20 percent of you found us from a friend. So … be that friend! Here’s our plan: podcasting's very first Shareathon. And here's a page explaining exactly how it works. So what are you waiting for? Get out there and start sharing and winning today! 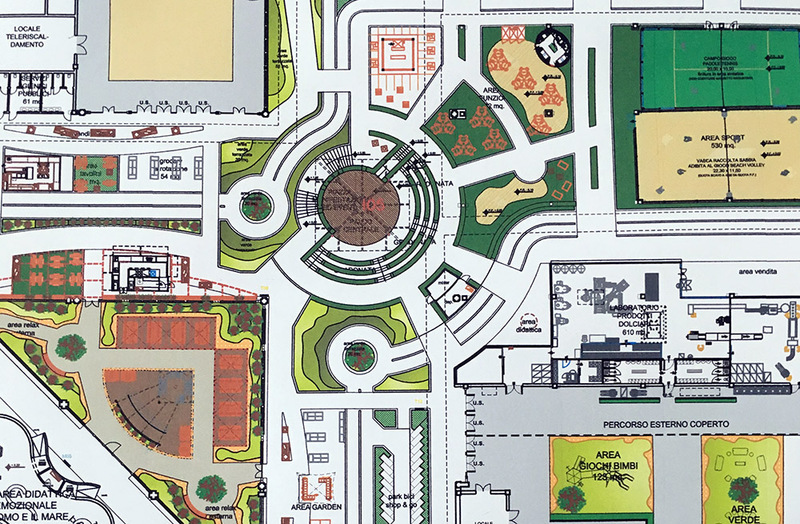 Detail of Eataly World map showing the beach volleyball court and the truffle area. Photo by Nicola Twilley. 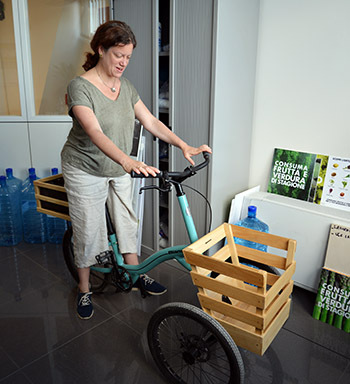 Cynthia tries out one of the custom-designed Bianchi shopping-cart-bikes that customers will be able to ride around the theme park. Photo by Nicola Twilley. 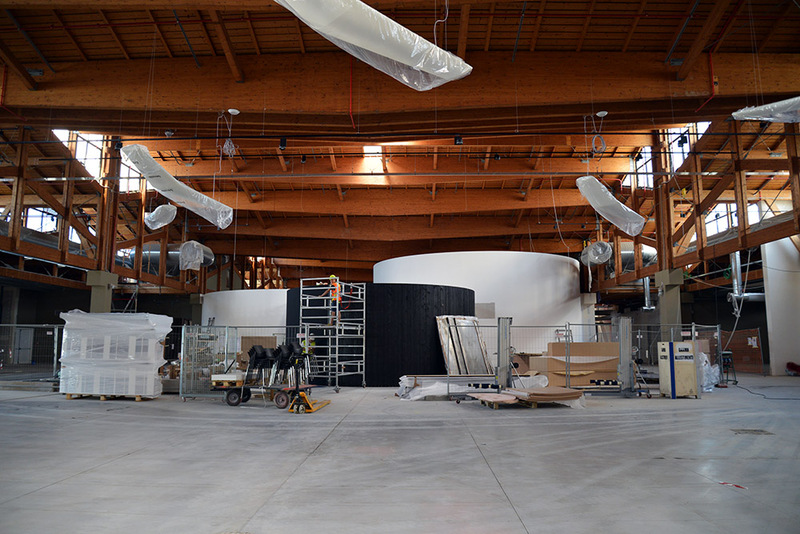 Eataly World is scheduled to open on November 15, 2017, in a former wholesale fruit and vegetable market on the outskirts of Bologna, Italy. It will be twenty acres in total—about a quarter the size of Disneyland—but they’re expecting ten million visitors a year, which is only a little less than the original Mouse Kingdom. 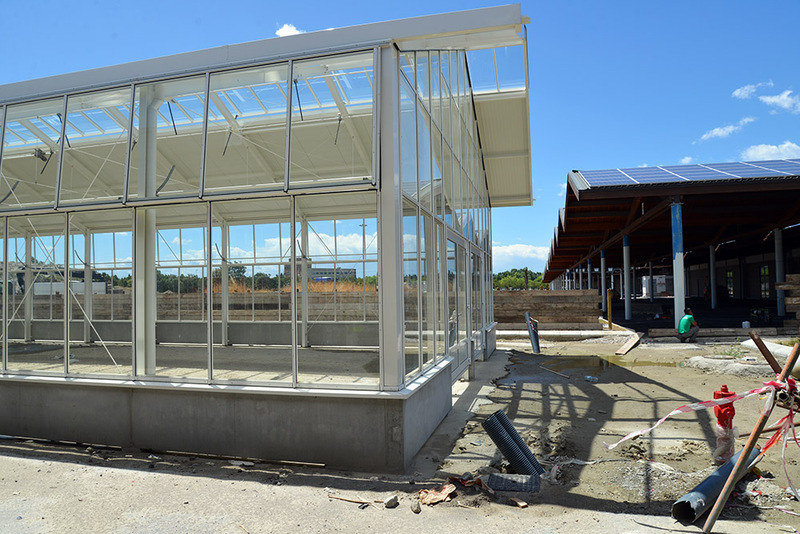 Its attractions include more than 200 different animal breeds and 2000 different fruit and vegetable cultivars, as well as 40 producers of everything from panettone to pasta, and dozens of restaurants. Entry will be free. Michael Ruhlman is an author whose most recent book, Grocery: The Buying and Selling of Food in America, examines the shifts in how Americans have bought food over the past two centuries, and the cultural and economic forces behind those transformations. Sunil Gupta is Edward W. Carter Professor of Business Administration and Chair of the General Management Program at Harvard Business School. He is author of the 2015 HBR Case Study "Eataly: Reimagining the Grocery Store." Toni Mazzaglia is the best. If you're planning a trip to Italy, you need to take one of her amazing Taste Florence food tours. And, if you're a journalist looking to report a story in Italy, Toni has seeming magical powers to make things work: you can reach her here. We can't recommend her highly enough! The interior of Eataly World, including the aromatic charred wooden wall of one of the six "rides": this one focuses on humanity's relationship with fire. Photo by Nicola Twilley. Eataly World is surrounded by vineyards, orchards, fields, and a greenhouse or two. Photo by Nicola Twilley. 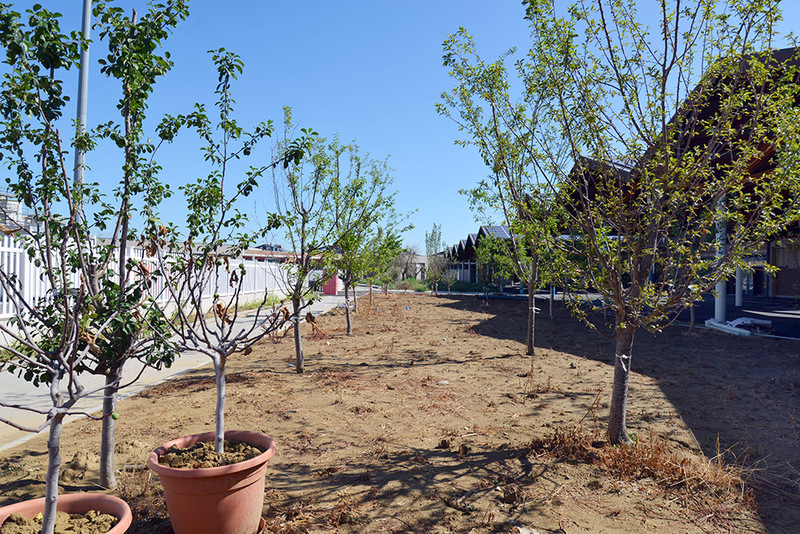 Trees awaiting planting outside Eataly World. Photo by Nicola Twilley. 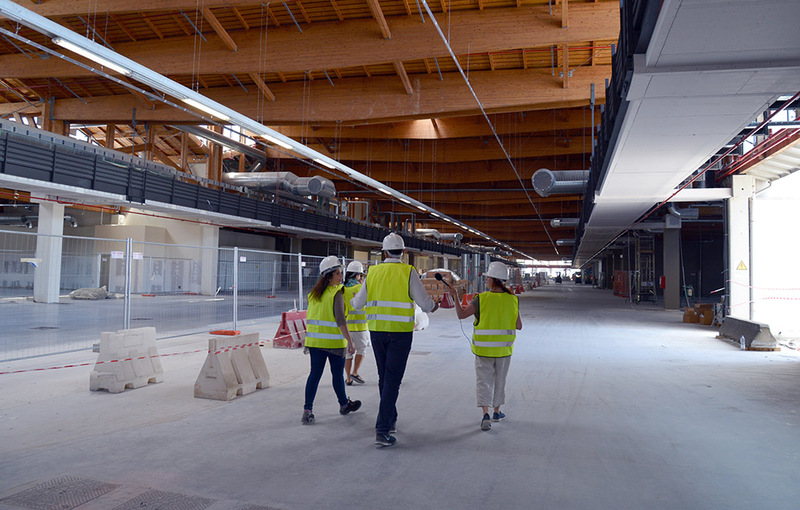 Toni, Silvia, Thomas, and Cynthia walking down one of two main aisles of Eataly World (future visitors will be able to ride their bikes down these halls). Photo by Nicola Twilley.